[p. 8:] There is no end to the question of the gods and their meaning. [p. 11:] …one cannot deny that the problem of the gods tends toward the infinite and has no final solution…. Anyone who takes history seriously will not accept a single method as definitive; the same should be true of anyone who studies belief seriously. Modesty is appropriate to these age-old problems of mankind. Every “final” insight is only a signpost on the road that leads farther and farther and may be trodden in the company of others who think differently. [pp. 97-99, on the Egyptian ability to combine the names of deities, combine their attributes, and on mistaken notions that Egyptian religion originated with, or seemed to tend towards, monotheism:] Is the purpose of these combinations a clever priestly “equalization” of conflicting religious claims, as Bonnet, like his predecessors, assumed? Must gods be “equated” with one another until one finishes with a vague, solar-tinged pantheism? Such an interchange of attributes, which leads towards uniformity, is un-Egyptian; if anything it is Hellenistic. The Egyptians place the tensions and contradictions in the world beside one another and then live with them. Amon-Re is not the synthesis of Amun and Re but a new form that exists along with the older gods…. It is clear that syncretism does not contain any “monotheistic tendency,” but rather forms a strong counter-current to monotheism–so long as it is kept within bounds. 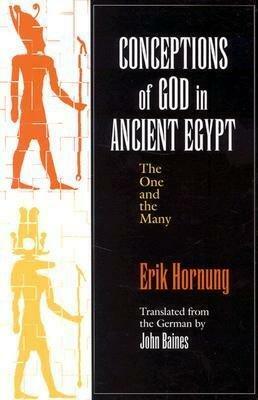 Syncretism softens henotheism, the concentration of worship on a single god, and stops it from turning into monotheism, for ultimately syncretism means that a single god is not isolated from the others: in Amun one apprehends and worships also Re, or in Harmachis other forms of the sun god. In this way the awareness is sharpened that the divine partner of humanity is not one but many…. We shall find repeatedly that Egyptian deities do not present themselves to us with as clear and well defined a nature as that of the gods of Greece. The conception of god which we encounter here is fluid, unfinished, changeable. But we should not impute to the Egyptians confused conceptions of their gods… It is evidently unnatural for Egyptian gods to be strictly defined. Their being remains a fluid state to which we are not accustomed; it escapes every dogmatic, final definition and can always be extended or further differentiated. The combinations gods form with other gods are transitory in many respects and can be dissolved at any time. This fluidity leaves no room for monotheism, which bases itself on unambiguous definitions. [pp. 113-4, on the various animal forms the goddess Hathor is depicted as:] In Hathor there is the maternal tenderness of the cow, but, among many other characteristics, also the wildness of the lioness and the unpredictability of the snake. Any iconography can be no more than an attempt to indicate something of her complex nature. I shall review some examples which show still more clearly that pictures of gods should not be understood as illustrations or descriptions of appearances, but rather as allusions to essential parts of the nature and function of deities. [pp. 124 -5:] But none of these animals, plants, and objects that are related to the manifestation of deities gives any information about the true form of a deity. According to the the texts the true form is “hidden” and “mysterious”; the Coffin Texts tell us that only the deceased may know the true form of a god. No thinking Egyptian would have imaged that the true form of Amun was a man with a ram’s head. Amun is the divine power that may be seen in the image of a ram, among many others, as Horus shows himself in the image of the hawk whose wings span the sky and Anubis in the image of the black canine (“jackal”) who busies himself around the tombs in the desert. Similarly, Christian saints, especially the four evangelists, may be shown in animal form or with the head of an animal. None of these images shows the true form of a god, and none can encompass the full richness of his nature–hence the variable iconography of Egyptian gods, which is seldom reduced to a fixed, canonical form. Every image is an imperfect means of making a god visible, characterizing his nature, and distinguishing him from other deities. [p. 160:] Like men, the gods die, but they are not dead. Their existence–and all existence–is not an unchanging endlessness, but rather constant renewal. From an early period the “dead” are only the damned, that is, those who are condemned in the judgment after death, or hostile powers; to be dead is not the same as not to exist. Siegfried Morenz emphasized that “for the Egyptians constant regeneration was part of duration.” The blessed dead and the gods are rejuvenated in death and regenerate themselves at the wellsprings of their existence. [p. 170:] The fundamental characteristic of everything that exists–this diversity–renders it impossible to credit the gods with absolute qualities or absolute existence…. The large number of the gods is itself an aspect of their diversity. The essence of the primeval god is that at first he is one and then, with creation and the diversity it brings, he is many. In the New Kingdom, “the one, who made himself into millions” is a common epithet of the creator which renders this characteristic explicit. “Millions”–enormous and unfathomable but not infinite multiplicity–are the reality of the world of creation, of all that exists. [p. 182:] For the Egyptians even death itself cannot call into question or abrogate living existence more than temporarily. It always brings with it a very great danger that existence may be extinguished, and this danger must be countered with extraordinary precautions; in this light Egyptian expenditures on mummification, burial, and grave goods becomes comprehensible. But from another point of view, as we have already seen in some detail, death means rejuvenation, renewal of all that exists, and the gateway to an enhanced life in the next world. So death in particular reveals the ambivalence of the nonexistent, which for Egyptians can be not just a reality but a positive and absolutely essential reality. Only through the nonexistent does creation become possible, so that the gods and the king are especially dependent on it for the perpetual renewal of their work of creation and for the avoidance of lifeless finality…. Several writers have stressed quite correctly that no trace of mysticism can be found in ancient Egypt. The Egyptians never succumbed to the temptation to find in the transcendence of the existent release from all imperfection, dissolution of the self, or immersion in an union with the universe. They remained active and often, to us, startlingly matter-of-fact; any sort of ecstasy appears quite alien to their attitudes. [p. 184:] Anything that is dogmatically fixed becomes estranged from the existent and must end by conflicting with reality. [p. 189:] Experience consistently teaches us that the causes both of historical and of religious phenomena are complex, and that our simplifications do violence to the material. [p. 242:] …we shall be able to comprehend the one and the many as complementary propositions, whose truth values within a many-valued logic are not mutually exclusive, but contribute together to the whole truth: god is a unity in worship and revelation, and multiple in nature and manifestation. [p. 254:] As believers and lovers we may be lost in the absolute nature of the moment, but when we observe history we know that nothing existent is definitive. Inexorably history destroys all “eternal” and “absolute” values and demonstrates the relativity of every absolute point of reference which we seek to establish. Hence the fanatical opposition to anything historical–or scorn for it which takes the form of unscrupulous distortion–on the part of those who wish to establish definitive, binding norms. One church, one state, one order of society for all mankind, the equalizing compulsion of one system for all–these and many other absolutisms have taken to absurd lengths a mode of thought which followed the law of unity and did not tolerate plurality…. All the evidence suggests that human society of the near future will be pluralistic and undogmatic–or it will not exist at all. In all spheres of life it will have to allow for the multiplicity of possibilities, without excluding the one as an extreme case. After the shock therapy of this century I believe that society will be thoroughly sick of dogmatic ideologies and “absolute values.” It is unlikely that human religious belief will be unaffected by the newly transformed mode of consciousness. Deep faith, in particular, must accept that God has never spoken his last word, even in the revelation of the sole God. A new stage of consciousness is open to a new revelation, the nature of which cannot be predicted at all, except that it will be different. [pp. 258-9:] The language in which we speak of the world will never be contained entirely in mathematical formulas, nor will it be contained entirely in words. So long as there is content and cannot be expressed in a univalent form, at every stage of consciousness language will turn to images as an adequate descriptive medium. The nature and appearance of Egyptian gods are inimical to any closed, final, or univalent definition. We see them develop in history, and we see them leading a constantly changing life of their own. What a god is cannot be defined. Whatever statements we make about him, it does not exclude a mass of other statements. Seen in another way, every god contains within himself all the information about a particular content, which took form in him and entered human consciousness in that form. For the Egyptians the gods are powers that explain the world but do not themselves need any elucidation because they convey information in a language which can be understood directly–that of myth. Every myth exhibits and interprets no more than a part of reality, but the totality of the gods and their relationships with one another exhibits and interprets the entire reality of the world. Whatever the nature of the gods may or may not be, in whatever system of concepts or network of associations we may place them, all attempts to “explain” them have been attempts to express the information they convey in a different, less ambiguous language. We sense that they say something valid about the world and about mankind. But no language has been found whose expressive richness can compare with that of the gods themselves. Again and again they refer us back to themselves, revealing to us the limitations of our conceptual universe. If we are to comprehend the world we still need the gods.